SOLD INDIVIDUALLY. 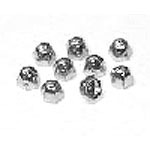 Metal acorn cap nuts (or PAL nuts) used on top of playfield posts and moving playfield gates on most Gottlieb games, vintage Bally games, and some Atari, Allied Leisure, and Fascination Int'l games, too. Most common use is on top of playfield posts to hold plastics (or 'light shields') in place. Gottlieb used these acorn nuts exclusively on their games for decades, and only these replacements will work on these games! Self-threading nut- bites on to playfield post stud and threads itself as you install it. Replace your old rusty, bent, scratched, damaged, or missing acorn nuts with these brand new replacements. Replaces Williams # 38-6543C and others. INSTALLATION NOTE: Old used acorn nuts are pretty easy to take off and put on, but brand new ones are usually a bit stubborn. We suggest installation with a 5/16-inch shallow socket driver wrench which helps apply downward pressure while turning the nut. These nuts are self-threading and often need some extra effort to get them to 'bite' and start, and to thread onto the metal stud when they are brand new.